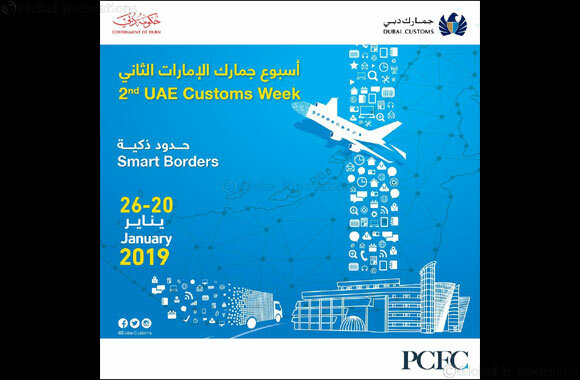 Dubai – 19 January 2019: Dubai Customs activities for the UAE 2nd Customs Week kick off on Sunday 20th January 2019 under the theme “Smart Borders”, and continue to 24th January 2019. The UAE 2nd Customs Week will help educate all segments of society and encourage them support customs activities and role in society and the national economy. “It’s very important to help everyone learn the essential role customs departments in the UAE play to sustain economic growth and protect the country. This will help us serve our clients in a better way to achieve better growth following the wise vision of His Highness Sheikh Mohammed bin Rashid Al Maktoum, Vice President and Prime Minister and Ruler of Dubai and in line with the Year of Tolerance values and principles” he said. Musabih pointed out the activities of the 2nd UAE Customs Week 2019 are meant to reach out to different clients, partners, employees and the public where the customs services are provided, and through smart digital applications and online channels. “Some of our activities are targeting school and university students in order to raise their awareness about the role customs departments play in securing borders, supporting the national economy and its efforts in hosting grand events like EXPO 2020” adds Musabih. Dubai Customs will also honor the new members of the Authorized Economic Operator (AEO). The AEO program is a partnership between Trade community and Customs, in which actors in the global supply chain can apply for AEO status to receive trade facilitation benefits and, at the same time, verify and increase their level of compliance and security. Hatta crossing will see a number of activities and events designed to enhance cooperation between Hatta Customs center and its partners, and clients.